London - The eight fastest amputee sprinters line-up on Thursday for the showpiece T44 100m final at the London Paralympics, amid predictions that all finalists could run under 11 seconds for the first time. The favourite for the title currently held by South Africa's Oscar Pistorius is Britain's Jonnie Peacock, who earlier this year lowered the single below-the-knee leg amputee world record to 10.85. The 19-year-old fired a warning shot to his rivals on Thursday night, winning his heat and equalling the Paralympic record set eight years ago 11.08sec - then warned that he would run faster. "It was a bad (head) wind, a big wind: 1.6m/sec. I'll be a bit quicker in the final," he told reporters at a cold and blustery Olympic Stadium in London. South Africa's Pistorius was second-fastest after running a season's best 11.18, with compatriot Arnu Fourie third quickest (11.29) followed by the United States' Richard Browne (11.33) and team-mate Blake Leeper (11.34). Jerome Singleton, silver medallist in Beijing, was slowest of the automatic qualifiers with 11.46. The two fastest loser spots went to Alan Oliveira of Brazil (11.56) and China's Lui Zhiming, whose 11.84sec was a new Asian record. Oliveira, 20, pulled off a shock victory over defending champion Pistorius in the 200m on Sunday but has played down his chances in the straight sprint, as has Pistorius. 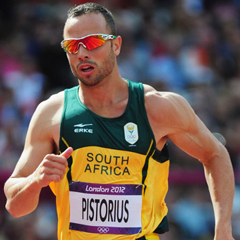 "It's not really my event," Pistorius said last week. "As Jonnie (Peacock) and those guys focus on the 100m, my focus is on the 400m, on the complete opposite side of the spectrum when it comes to sprinting," he said.